There probably is not an animal on the face of the planet that can compete, blow for blow, with a dragon. With great wings for flight, fearsome claws and teeth for battle, and fiery breath that incinerates its enemies, there is just not much chance for competition. And that is why we feature this amazing beast on so many awe-inspiring dragon t-shirts. Perhaps the most important aspect of our dragon t-shirts is not how incredible they look but rather that they are incredibly comfortable, making them great garments to wear on any given day of the week when a stylized tee shirt is appropriate for wear. 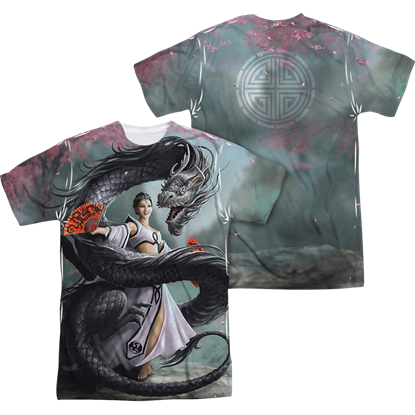 In addition to their comfort, our dragon t-shirts display impressive designs. 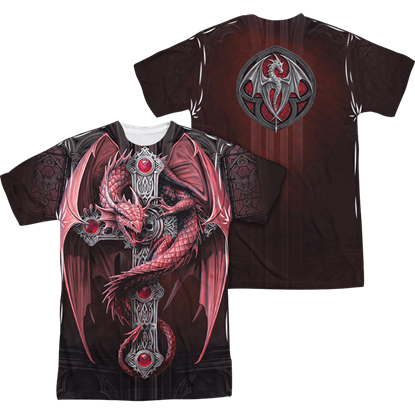 Not only do the shirts feature a wide assortment of designs, ranging from dragons breathing fire to dragons attacking castles to dragons battling each other and beyond. Each design is an incredible artwork that will not only become an instant personal favorite but will also captivate and awe all those who see it. And not only do we offer plenty of awesome dragon t-shirts for adults both male and female, but we also offer childrens dragon t-shirts too, ensuring that no matter what age you are at, everyone can enjoy one of our awesome dragon t-shirts. Dragons are a protective creature, seemingly born to horde and guard things. And the graphic on this Altar Drake Gothic Zippered Hoodie depicts a dragon doing just that - vigilantly guarding an altar topped with a grand gothic cross. Magical creatures tend to find ways to coexist, as seen in the design of the Anne Stokes Copperwing Nouveau T-Shirt. 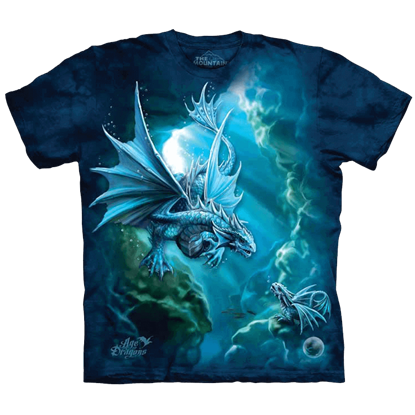 On the front, this fantasy shirt displays a fierce dragon posed behind a feather-winged fairy. Looking at the graphic on the Anne Stokes Dragon Dancer T-Shirt, you might imagine the sensation of gentle pink petals falling across your face and the soft hum of music accompanying the Oriental dancing duo. 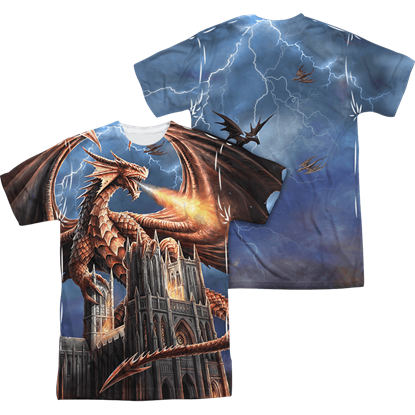 Fury rains from the skies in the design of this Anne Stokes Dragons Fury T-Shirt! Streaks of lightning join dragonfire in lighting up this dramatic scene. A gigantic dragon towers over the gothic cathedral on which it perches. Only the foolhardy would dare risk the wrath of this fierce beast by intruding its lair. 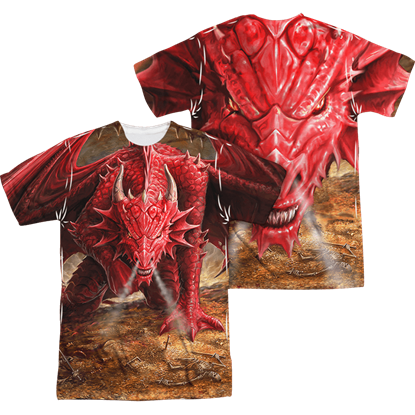 The Anne Stokes Dragons Lair T-Shirt shows the perspective of the unfortunate who has aroused the ire of a dragon, who stalks forward with malice. Dragons are drawn to precious things and protect what they view as theirs with vicious jealousy and fervor. 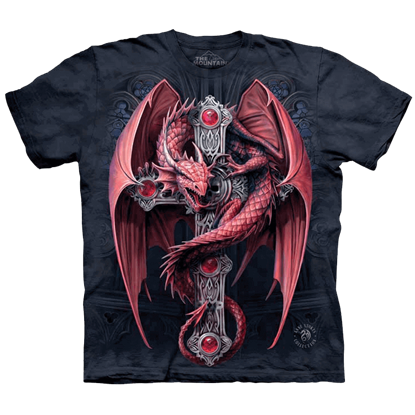 The Anne Stokes Gothic Guardian T-Shirt depicts a young dragon that has become the keeper of an ornate gothic cross. Be not at ease with your holy surroundings. 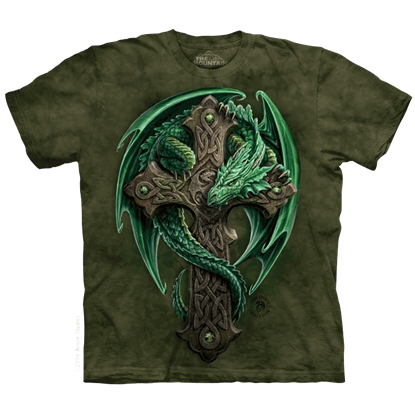 The church may serve as a sanctuary, but the dragon of the Anne Stokes Gothic Guardian T-Shirt allows no one near its charge. It wraps its serpentine body protectively around a jeweled cross. This enchanting scene heralds back to a time when a strong kinship existed between the fairy folk and the dragons. 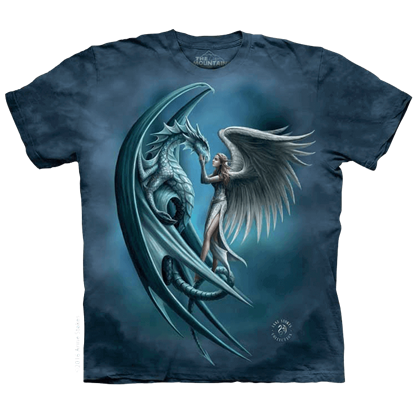 A look of mutual trust and affection are exchange between the two beings in the Anne Stokes Once Upon a Time T-Shirt. The crystal ball glows with their combined powers as the two dragons create a magical formation. 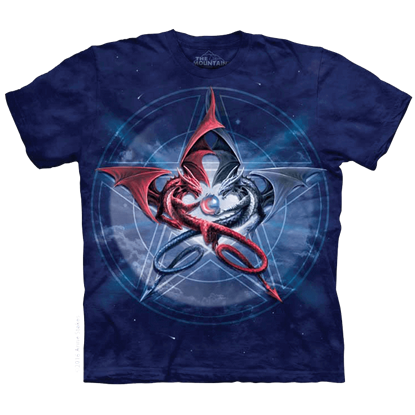 Beams of light pierce the starry sky as they arrange themselves into a five-point star on the Anne Stokes Pentagram Dragons T-Shirt. On its way to complete an urgent quest, this dragon takes a moment to receive a blessing from an angelic being. Clouds and mists fill the night sky and a forest landscape stretches below them in the Anne Stokes Silverback T-Shirt. A family of sea serpents enjoys some quality time in the scene presented by the Anne Stokes Water Dragon T-Shirt. A blue dragon and its baby relax along the floors of a cavern. The light from the entrance creates a peaceful ambience. The gems and Celtic knots that decorate the wooden cross draw you closer, but you halt immediately when its protector reveals itself. 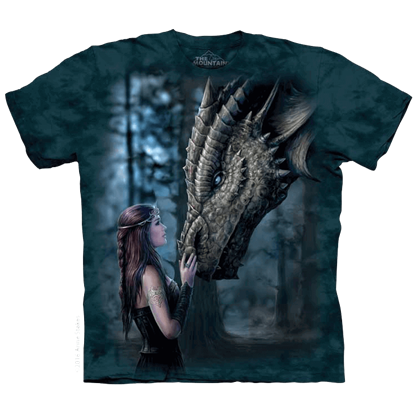 The dragon of the Anne Stokes Woodland Guardian T-Shirt keeps a keen eye on visitors to its realm.